In less than 5 minutes you can be reading our exciting new sci-fi novel Rocket Babe - Reflection! Kindle or paperback editions are available now from AMAZON! Don't have a Kindle? Download the FREE Kindle APP where you find Rocket Babe on Amazon! *Check Amazon.com for their current discount price. Hey! Don't just sit there, LIKE US on Facebook! 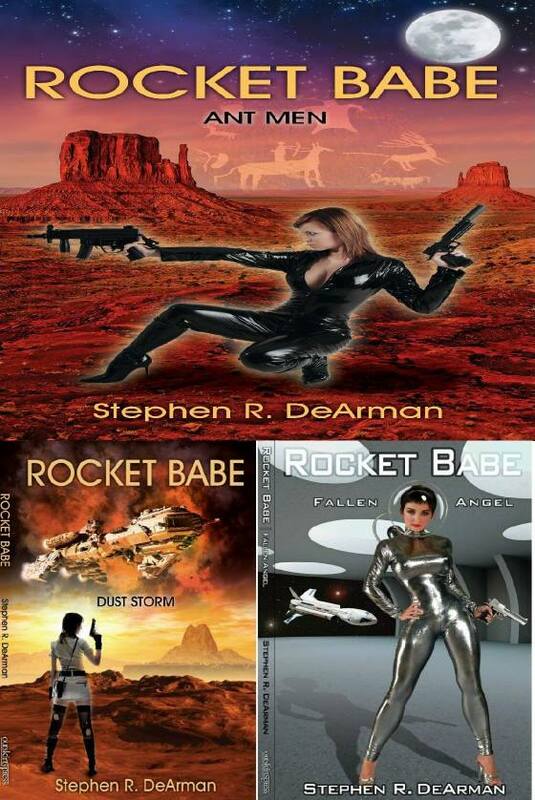 Signed / personalized paperback copies of Rocket Babe - Dust Storm, Rocket Babe - Fallen Angel, Rocket Babe - Ant Men and Rocket Babe - Reflection are all available directly from the author! Books are great gifts for any occasion! Holidays, birthdays or just because! Standard book rate shipping: $4 for 1st book; $1 for each additional book per address in the same order. Please allow 7-10 days for shipping, longer during the holidays. *Special "Set" pricing! Get all 4 books for $46.00 includes shipping within the continental U.S.! Saves over $10 off the regular price and shipping! *Shipping outside the USA available. Contact us for a postage quote before placing your order. Send your email order to Verna at: vernarockets@hotmail.com with BOOK as the subject. List each dedication separately and clearly. Be sure to include the full shipping address. Verna will reply with how to send in your money order. Sorry, money orders only.